On May 3, 2000, just four days before his second birthday, Sean Young was diagnosed with cystic fibrosis. Soon afterwards, his family moved to San Diego and brought their son to Rady Children’s Hospital-San Diego, where Sean has received care for more than a decade. Once considered a disease of childhood, as patients rarely lived into adulthood, cystic fibrosis can be managed through various treatments and lifestyle changes. Today, patients are living longer than ever before, with an average life expectancy of 41 years old, according to the Cystic Fibrosis Foundation. Cystic fibrosis is an inherited disease that causes the buildup of thick, sticky mucus in the lungs, pancreas and other organs. In the lungs, this mucous causes inflammation, chronic infections and eventually irreversible lung damage. In the pancreas, this mucous blocks the release of digestive enzymes, leading to malabsorption and malnutrition. Sean’s cystic fibrosis affects so many of his organs that he sees four different specialists at Rady Children’s. One is Dr. Meerana Lim at the Cystic Fibrosis Center, who he sees every three to four months, or more frequently if he’s not feeling well. He is followed closely by a nurse practitioner, respiratory therapist, nutritionist and social worker on the center’s staff as well. Sean also began seeing endocrinologist Dr. Thomas Kelly four years ago when he was diagnosed with cystic fibrosis-related diabetes. The family credits Dr. Kelly with Sean’s smooth transition to his new medical routine. “He recognized the fact that kids need to be kids first and sometimes that is the best medicine of all,” says mom, Katrina. Sean works hard to manage his disease, which requires a strict daily routine. Every morning, he wakes up at 5 a.m. to do his chest therapy treatments and take three inhaled medicines. He repeats this regimen every evening, squeezing in treatments between homework, sports and chores. Throughout the day, Sean takes 13 medications and swallows up to 30 pills. Along with antibiotics and special vitamins, he also must take enzymes with every meal to help him digest his food. Sean must eat at least 3,000 calories a day, often relying on nutritional supplements to help him gain weight and grow. Now 17, Sean will be a senior at La Costa High School next year. Along with working at Round Table Pizza, he tutors kids after school. 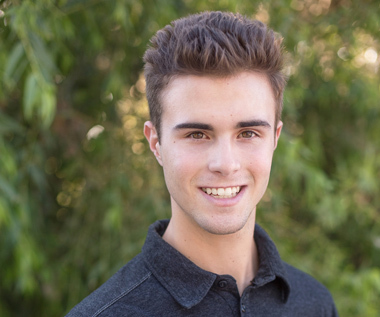 Sean also raises awareness about cystic fibrosis by speaking at fundraising events throughout San Diego, as well as at local biotech firms and pharmaceutical companies. One of those dreams is to be a doctor, so he can treat children like himself. “He is determined that he will defy all expectations and lead a long and healthy life,” Katrina says.